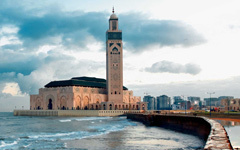 Extend your tour by visiting the beautiful city of Casablanca! Learn more by visiting our extensions tab. Private motor coach and driver the entire time. Deluxe hotel accommodations for seven days at first class hotel in Marrakech. Most meals including daily breakfast, some dinners and a lunch. Optional "Moroccan Cooking Lesson" in the country. A special showing of "Destination Craft with Jim West" Morocco episode. “Mosaic tile making” workshop with a master artisan. Optional "Horse drawn carriage" ride through Marrakech. "Souk shopping" experience in central Marrakech. An informative talk about Moroccan oils, plants and fragrances. "Moroccan beading" workshop with a master artisan. Optional "Camel Ride, dinner and Moroccan show." Shopping in extraordinary leather and antique shops. A Moroccan rug weaving demonstration and presentation. A walking tour of the Bahia Palace with a professional guide. Optional visit to the “Yves Saint Laurent Museum”. Craftours lanyard, luggage tag and Morocco gift. A commemorative Craftours Arts and Crafts Morocco Expedition totebag. *Transfers to and from the airport in Morocco. Travel insurance available and highly recommended. *Transfers available for "Land Only" guests at an additional charge. A drive from Marrakech to Casablanca in a private motorcoach. Daily breakfast and a dinner.